I have been knitting for 8 years or so and have not moved past knitting rib stitch rectangles. I want to change this. I have been browsing on Ravelry and hanging out at my LYS. 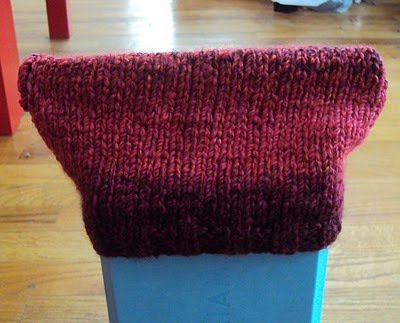 Currently I am knitting these chunky lil hats for charity - as modeled by my yoga block. All I did was cast on 32 stitches (us size 8 needles) k2p2 for six rows then stockinette for 10 inches (end on a knit row) and k2p2 for 6 rows, cast off and sew up the sides inside out, then flip over. After using some more of my stash, I am moving on and will be trying to knit in the round even! Wish me luck! Ah it so beautifully modelled by your yoga block! I really like the simplicity of this chunky hat and think its lovely - very different from the trendy animal winter hats with ears and nose.